My advice for creating longevity for intentional communities comes from my own experience living for over 27 years in a community I founded. It was a super fun but often bumpy ride and now my personal dream of living there for the rest of my life has gone. If I knew what I know now would I have done things differently? YES! Do I regret my commitment to this experiment? No! My life is so abundantly rich with memorable experiences and great friends that I know it was all totally worth it. Bellyacres Artistic Ecovillage was founded in 1987 and is located in the Big Island’s lower Puna District. It sits between the Pacific Ocean and Kilauea Volcano, which has been erupting ash and oozing or spurting lava for all of our community existence. My motivation for living in community came after two residencies at Israeli kibbutzim and from cofounding a workers’ collective in Canada. I saw the opportunity to manifest an innovative community based on principles such as living cooperatively with a convivial and fair way of life, causing minimal ecological impact, and striving to become more socially, economically, and ecologically sustainable. I made the huge assumption that my international busker friends whom I invited to participate also supported this as our vision but later realized that our common bond was a love for performing, partying, and independent living and not for intentional community. My belief that a group of anarchist jugglers could learn to live harmoniously in a Hawaiian jungle has been seriously compromised in many ways in recent years, leaving me with many lessons learned from this experiment. Having a shared vision is crucial for any community. We originally described ourselves as a jugglers “collective” without thinking much about the meaning of the word. We entered a state that author Scott Peck describes as “community chaos” and so I focused on creating some structure within our anarchist gang. Slowly and painfully, we started having more engaging meetings, improving our communication skills, and even adopting bylaws, articles of incorporation, and the legal name “Village Green Society.” I strongly believed in the old adage that “it takes a village to raise a child” and, as a teacher, I was always focused on providing for kids. Other members were not so enthusiastic; in fact, a majority at an early meeting voted to keep kids excluded from our land as much as possible because “they made too much noise.” I laughed knowing that it was impossible and predicted that these same troubadours would have kids of their own when they grew up; but, this proved only partly true. Recruiting community members needs to be done very consciously and carefully. We all have challenges learning to live communally. With very few exceptions, we have been raised outside of intentional communities and bring our deep-rooted conditioning based upon competition, scarcity, individualism, and personal ownership. Human nature itself has a predisposition to reject many of the compromises required for community and to under-appreciate the value of all that communities can provide. This was definitely the case with our group. I erroneously held the belief that embracing diversity meant adopting the principle of total inclusivity and so our original membership was open to any of my juggling friends who wanted to join. The only financial commitment they had to make was a lifetime, non-refundable membership fee of $2,000. This entitled them to set up a campsite and maybe a jungalow. For an additional $4,000, they could build a full-sized house. I realize now how seriously naïve and flawed this model was. We really should have adopted a carefully thought-out recruitment process including a detailed interview procedure; a contract outlining responsibilities, rights, and values; and a well monitored probationary system. In 1990, after we already had 21 members, we established a new member recruitment procedure. It definitely reflects how alternative and inexperienced we were at the time by inclusion of questions like “What is your favorite Beatles song?” We increased our membership fee to a whopping $3,000 and house sites to $5,000. All new members were put on a 12-month probationary trial; however, this was flawed because most of them did not stay living on the land during this time. New members were accepted by consensus at our AGM, even though most had never lived with existing members for more than a couple of weeks. Every member needs to fully embrace the decision-making process. I introduced our group to the concept of consensus decision making, as I had two years’ personal experience using the method with a workers’ collective in Victoria, Canada. With our Bellyacres experiment, I learned for consensus to work it is imperative that everyone is committed to learning the process and be willing to donate the time and energy to practice it. No one in our group disputed our decision to have a consensus-minus-two process (until 2014); however, we never had any study sessions, training, or workshops on how to effectively utilize it in our meetings. Looking back, this was a mistake. Two regular weekly meetings is a basic minimum requirement. Our early meetings were hilarious with more of a party scene than community organizing—people would drink, smoke, and share jokes, so keeping conversations on track was crazy. I introduced the concept of rotating facilitators, agendas, minute keeping, and motions. We were on a steep learning curve and two members expressed their distaste for meetings by heckling randomly from the outside. I would have liked to have had three weekly meetings: one for business, one for personal communication and check ins, and one potluck for food and fun, but this never happened. We functioned best when we had two weekly meetings and regressed when these connections lapsed. I created the tradition—and even made it a serious request—for all residents on the land to attend a Sunday potluck and a weekly campfire on Tuesdays. Despite our busy schedules and other events, many of us acknowledged the value and importance of getting together, with the work-exchange folks and guests, to talk story and deal with issues. Ironically, when more of our members arrived in the wintertime, weekly meetings often got superseded by party or vacation plans. Expect and accept unequal participation. Structure is important in any organization but participation is what determines effectiveness. Even though our original membership of 12 eventually increased to 35, we have never had more than six members living full-time on our land at any one time, for various reasons, and sometimes I was the only resident member. While major decisions are made at our annual general meetings and attendance has varied from 12 to 22 members, we have had severe limitations on the possibilities for full participation in ongoing decision making. As technology has improved, we have used newsletters, telephone conference calls, and emails. However, without a clearly approved process and with a membership geographically dispersed across several countries and half a dozen time zones, it has worked only marginally for improving communication, but not much for decision making or for involvement. The Bellyacres experiment has taught me to not expect everyone to be equally involved or to contribute the same amount of work. This fact of community life is not easy to accept but is necessary. It is also cruelly ironic that members who are only peripherally involved and contributing very little in work still often demand a full role in decision making. From my two stays on kibbutzim in 1969 and 1973, I was introduced to the socialist concept “to everyone according to their needs and from everyone according to their abilities” and it fit my humanitarian ideals. As I brought together our collective, I tried to factor in the wisdom of a kibbutz founding member who told me that despite their egalitarian principles, when the annual elections of officers happened, the same 20 people always volunteered. This seems to be the situation in almost every community and inevitably results in power being concentrated within a small group. Be honest and realistic about leadership. Our transient membership and lack of resident members often resulted in decisions being made by me or just a few individuals out of necessity. As the founder, I was always the public face of the organization and originally accepted responsibility for the legal, financial, and physical-reality development of Bellyacres. Personally, I have never desired to amass power and control, yet I found myself constantly playing the role of leader by necessity. I only ever wanted this to be temporary until other members began to take on more responsibility and become more involved in activities that moved us along. Unfortunately, this was not our reality and what I discovered instead was a serious case of Founders’ Syndrome, which came to a head in 2014 and contributed to me deciding to leave. My studies of sustainable community development show that most have a hierarchical organization with a spiritual guru, a charismatic leader, or a group of “elders.” Secular egalitarian communities seem to have the greatest difficulty in staying together after the initial idealistic euphoria wears off. I know of a very few (Twin Oaks, Sandhill, East Wind, The Farm) that have survived more than 25 years, outlasting their founders and developing identities not dependent on particular personalities. The development of an egalitarian structure of governance is a huge challenge facing communities and one that requires commitment, training, and consultation with experts if it is to succeed smoothly. Regretfully, while our ecovillage still exists after 30 years, it did none of these and is now paying the price. Share a common vision regarding children. From our beginning, we were very divided about the desire to include children in our community and this has plagued us still today. During my two kibbutz visits and my workers’ collective experience, I was impressed that children were always a big part of the ideology and it led to my belief that children are an essential part of any sustainable community. Unfortunately, when I gathered the founding members of Bellyacres, we never discussed this until after we’d started our settlement. A major factor I had seriously overlooked was that all my new partners were bohemians. They were in a phase in their lives where they believed kids would severely threaten their freedom to party hearty and to travel to the streets of busking cities worldwide. My naiveté on this subject was clearly expressed one evening over dinner at our first encampment. A friend was visiting us with his girlfriend and a newborn baby. This little addition to our party was prone to get a little restless in the night and her sweet shrill cries cut through the jungle air. We had some late-night party people who expected to get a deep and undisturbed sleep when they eventually crashed. When we went around the circle, one by one everyone said how kids didn’t belong here and that was not what they signed up for. How different this perspective was to mine—I looked around and reckoned that many of these same people would have their own kids in a few years and attitudes would change. I was only partly right on this and never expected that it would be the childless partners who’d end up living at Bellyacres while members with families would choose the better education and work opportunities of the mainland US or Europe. I thought we failed really badly by never having an official policy regarding children. Over the years, I offered single-family accommodations, counseling, transport, and free circus classes for loads of kids. But when parents had expectations of finding a community with compassion that embraced their kids by providing supportive aunties and uncles and surrogate parents, they were generally very disappointed by many members’ responses. In most cases, there was a “clear hands-off approach,” coupled with the feeling that they were just “not a kids person,” or having worked entertaining kids for many years had an attitude of “I need to take a break while I’m on holiday.” I felt very differently, I was not on holiday, this was my permanent home and I wanted to have loads of happy, thriving kids around. In all my years at Bellyacres, this issue alone caused me the most grief. My own daughter lived there from birth but never established anything close to the connection that occurs in blood families with grandparents, aunts, uncles, and cousins sending birthday cards, Christmas presents, and checking in regularly about school grades, favorite hobbies, and bad colds. There are very few long-lasting bonding relationships between the different generations at Bellyacres, and sadly when the opportunity has existed the general membership has not embraced it. Establish a clear pet policy. Pet ownership has been another reoccurring issue for us, with the understanding that owners are responsible for pets’ behavior and some do a better job than others. Because of repeated bad experiences with neighbors’ unruly dogs roaming our land, pooping, killing our chickens, and even a goat, we adopted a “no dogs policy.” There have been controversial exceptions and some very heated debates regarding members who had dogs or renters who wanted to bring dogs. Not all dogs are alike and our decisions about which dogs and owners are acceptable have been erratic and often not rational and have had some severe negative effects on residents’ relationships. Cats tend to be more benign, at least as far as humans go (impacts on wildlife are a different matter); however, they can be unbearable at times with wild cat fights and raids on neighbors’ homes for food, usually at night. Sometimes, with a cat population close to exceeding the number of residents, we’ve had to place household limits and insist on neutering. Not every owner willingly accepts community restrictions on pets, especially when pets are kid substitutes, but it is essential for the sake of long-term harmony. Establish a clear drugs policy. Drug policy is often a defining issue in the membership of a community and my understanding is that the longest-lasting spiritual communities are very restrictive. Being renowned for our amazing parties, we have had no rules and a very liberal attitude to drug use and our members have indulged, mostly very responsibly and without adverse consequences. Drug use, both legal and illegal, is generally considered a personal and private issue; but, where communities do not create clear standards and boundaries, major problems can arise. We had to impose strict rules regarding the cultivation of illegal cannabis on our land until medical marijuana permits became an option. After a particularly bad experience, we insisted that illegal drugs are not stored in our communal spaces. We have attempted to establish a culture of responsible drug use and have mostly succeeded given that Bellyacres is located in one of the marijuana capitals of the country and our modern society accepts tobacco addiction and alcoholism as socially acceptable. We adopted no-smoking zones and have taken car keys away from inebriated residents and guests wanting to drive. Apart from this, we have been extremely tolerant of drug use and some abuse. This could have been an issue we dealt with better when recruiting members, but people’s habits change over time so having a clear policy could really help reduce later issues. Late in our development, I learned to ask work-exchange folks and interns if they were on or had been on any medications for mental health issues. Having lived for three years with one of our founding members going through severe manic depressive episodes due to a bipolar condition, I learned how crucial medication can be for stabilizing health. If answered honestly, this question enabled us to be more supportive and understanding when living with anyone mentally challenged. It’s very hard to enforce responsible medication practices but since we all are impacted, it is a respectful request to make. Be prepared to deal with mental illness, depression, and withdrawal. These problems affect many in our society at some point in their lives and will inevitably impact your community. After years attempting to support our bipolar member, we made one of the hardest of our group decisions and revoked his membership because we believed he would get better treatment and support if he moved back to North Carolina. It was a huge lesson in tough love but we were right because he regained control of his life and now appreciates that we were caring for him the best way we could. Choose a location that suits your lifestyle. Where your community is located will seriously affect your healthy development so think ahead and get a good picture of how your neighborhood will look 30 years into the future. You will need to have neighbors who accept you. We bought 11 acres of Hawaiian jungle for $55,000 in an area where unpermitted structures and squatting were common practices. Our land was close to a beach, warm ponds, and lava adventures. It had lots of useful trees, a great climate, and adequate rainfall to fill catchment water tanks. It was also adjacent to an undeveloped subdivision with 933 lots selling for less than $5,000 and we envisioned our friends buying many of them and expanding our community. We chose to live with the predictable mosquitoes and jungle critters, droughts, tropical storms, rocky terrain, etc. What we did not anticipate were new issues like climate change, fire ants, rat lung worm disease, invasive tree overwhelm, discretionary permitting enforcement by County and State agencies, and the build-out of three neighborhood subdivisions which brought a huge influx of people, including many supporters of our community development programs, but also a few opponents who managed to successfully impose a tyranny of the minority. In our idealistic early days at Bellyacres, we studied and dreamt of living off the land. We put a great deal of energy, money, and other resources into a variety of agricultural projects that, for one reason or another, were incompatible with our membership, other projects, or the suitability of our environment and land. We had to constantly make compromises and adjust our perception of what was possible given our resources and location. Trial and error has its price. I discovered over time that a subtropical jungle and climate was not the most conducive place to live as we grew older. Perceiving ourselves as eco-warriors, we originally removed a minimum of trees to accommodate our basic needs. Eventually we realized that air and light and distance from bugs and creeping foliage was essential for our healthy living. Removing more trees around houses also became a safety issue and a necessity to prevent leaves contaminating catchment water systems. If we had originally made a lot more clearings and cut down more trees we would have saved ourselves the huge amounts of work required later. The jungle never sleeps or takes a vacation! In striving for a high level of sustainable living, we also committed ourselves to lots more hard work with off-grid power, catchment water, and organic farming, and are only now realizing how challenging this is for our aging membership. Learn to love the food that loves to grow where you live. While our group officially committed to increasing our level of sustainability, I’m not sure if members understood the implications of this. In terms of food, my view was that we should be growing locally appropriate foods that were suited to our subtropical climate. Having lived in the tropics for over 40 years, I found it easy and preferable for my staple foods to be breadfruit, avocados, bananas, citrus, and exotic fruits, etc. I estimated that 70-80 percent of my food was grown on the island. By comparison, my partners preferred to maintain their temperate-climate diet and struggled to grow lettuce, spinach, tomatoes, and cucumbers, etc. in our greenhouse. While the crops I was eating were drought-resistant and required virtually no maintenance, the greenhouse crops need watering twice daily by hand. This practice placed a huge burden on our labor pool when other work needed to be done and could have been more efficiently resolved by members’ eating the food that grew easily on our land and/or purchasing temperate crops from our weekly farmers’ market. Define what sustainable living means to your community. In my view, sustainable living goes far beyond permaculture systems, organic gardens, fruit trees, and animal husbandry. It has to include membership, community service, buildings, transport, recycling, energy, and more. Wherever you live, raise worms and rebuild your soil, for continuum. Living on lava rock, I was very motivated to experiment with soil production and eventually learned the importance of earthworms. Aristotle called them “the intestines of the earth,” Charles Darwin wrote a whole book about them, and for the organic gardener, they are the single most important element in the program of building a rich, healthy soil. Using manure from our two horses to feed the worms, I was able to produce enough worm castings and worm tea to feed all our crops without needing to purchase any imported fertilizers for the last seven years l lived there. This is most critical for community members who invest large amounts of time and energy. Our original exit strategy did not take this into account and I now realize it needed to be clearer and more detailed to allow for the changes in people’s relationships, values, and beliefs that inevitably happen over time. Many communities fold because they cannot survive the impact of founding members’ pulling out and needing to get repaid. I ensured the future for Bellyacres by buying the land outright and putting it into a land trust. However, my own future has now been compromised due to complications in selling the two houses I own on the land. Stay legal if you want an easy ride. I’m presently working on a book entitled My Sustainable Community Experience: 27 Years Living with Jugglers in the Jungle. It’s an autobiography with lots of juicy personal stories that I hope will serve to make the community experience relevant, important, and more successful for present and future communitarians. Be prepared to deal with disasters by keeping your whole group committed to staying united. Start by building an amazing communal kitchen—it’s your most important structure. Do not try to live out of sight of your community members. Do not build anything temporary. Don’t share cars, houses, or partners. Celebrate the financial successes of other members. Don’t let the bookkeeper run your organization. Be open to different spiritual practices and beliefs. Develop rituals for meals, meetings, and celebrations. Be patient with those who work slower or work less than you. Don’t permit passivity and non-participation. Review your group vision every three to five years and get 100 percent buy-in. Post bylaws, rules, minutes of meetings, vision, and community events prominently. Have a clear enforcement policy. Celebrate weddings, births, birthdays, etc. together. Give priority to your community members over other outside friends. Identify the talents and weaknesses of your fellow members. Don’t assume smart people have learned basic life skills. Have flexibility, compassion, and forgiveness. Be human. Do not expect people to be perfect all the time. If you want community longevity, build a cemetery. 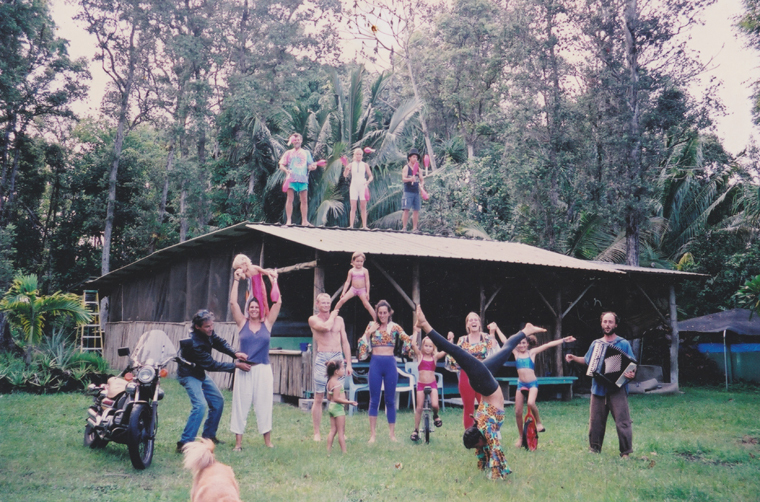 In 1987 Graham Ellis founded Bellyacres Artistic Ecovillage on a 10 acre jungle lot with a vision to experiment with sustainable community living practices. By 2007 Graham had raised $500,000 to build the Seaview Performance Arts Center for Education (S.P.A.C.E. ), which in 2010 was described as “perhaps the most sustainable community center in the USA.” His article “My Struggle to Legalize Sustainable Living” appeared in Communities #168, Fall 2015, and he is currently writing a book, My Sustainable Community Experience: 27 Years Living with Jugglers in the Jungle. As we prepared this issue for press, we learned that Graham was deported from the US on July 19, 2017 for an expired visa under the stricter immigration enforcement protocols put in place by the Trump administration. He, his wife, and their five children had already been planning to relocate later this year to the UK, where he hopes to serve as a community consultant—but uncertainty remains about when or if the rest of his family will be granted the visas necessary to join him. See www.civilbeat.org/2017/06/a-big-island-juggler-with-leukemia-faces-deportation.